Dr. Rieger is board certified by the American Board of Pediatrics and is a Fellow of the American Academy of Pediatrics. She graduated from Columbia College/Columbia University with a bachelor of arts degree in history and studied European history at Cambridge University, England. 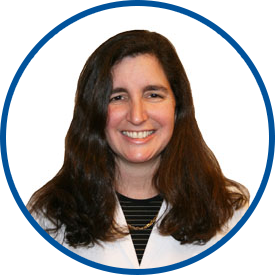 She received her medical degree from Albert Einstein College of Medicine and went on to complete her post-graduate studies and pediatric residency at Montefiore Medical Center. She also worked in the pediatric emergency room at The Children’s Hospital at Montefiore and acted as a preceptor for pediatric residents at the same institution. While in private practice with a pediatric group in Pelham, Dr. Rieger began working as a part-time pediatrician with Westmed Medical Group in April 2010 and joined Westmed as a full-time physician in January 2011. She sees patients at 210 Westchester Avenue in White Plains. Her current affiliations are with White Plains Hospital and Greenwich Hospital. Dr. Rieger lives in Westchester with her family. Her personal interests include biking, travel and literature. We couldn't be happier with Dr. Rieger. She is patient, caring, and extremely knowledgeable. Thank you Dr. Rieger! Dr Reiger is the best! I'm a new mom of two kids under two and I'm a nurse. while i possess some medical knowledge children are not my specialty. Dr Reiger always makes me feel comfortable to ask any and all questions and give great advice! she's a great addition to your team! Dr. Rieger is amazing beyond words! my kids are in the best care ever and I've never been more comfortable with a provider than I have been with her. Kudos to Dr. Rieger!! She is an excellent doctor and amazing with kids! !